Paul and I pride ourselves on not having turkey on Thanksgiving. Unless we have guests over or are guests at someone’s house, we usually skip the turkey on Thanksgiving altogether. But we do miss the pomp and circumstance of pulling a turkey out of the oven this time of year and eating endless sandwiches day after day after day. In the past, we have bought a precooked turkey and crafted a turducken. This year, we decided to smoke a turkey on the grill. Prepping our propane grill for to smoke to cook a 16 lb. turkey took some work. After we wrapped several grill components in heavy aluminum foil and soaked mesquite chips for an hour, the grill was ready to go. Prepping the turkey took a bit longer — 12+ hours in advance to brine the turkey. 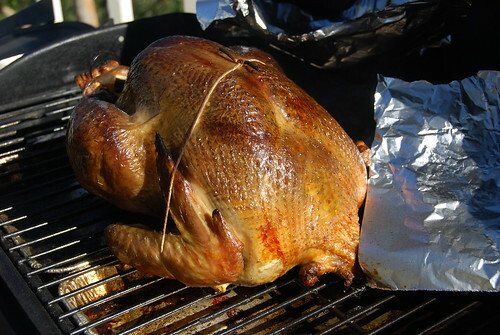 Brining the turkey in combination with smoking with it on the grill assures a moist, flavorful turkey. Dry turkeys you need to cut with a hacksaw are disgusting. I’m sure the neighbors upstairs loved the smoke wafting their way for a few hours. Then the propane grill ran out 2 hours into the cooking. Reminder to self on next grilling project: check propane tank levels. But with a quick preheat of the oven, the turkey was done after 1+ hours indoors. The turkey was saved! It still had a smoky essence and will be devoured in sandwiches for days to come. The brine included soy sauce and it created a flavorful skin and added depth of flavor to the turkey (regardless if you decide to smoke the turkey or not). 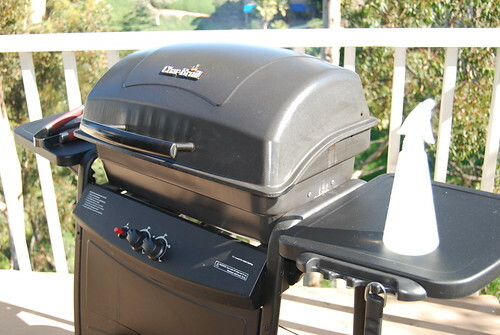 Further instructions on smoking a turkey on a propane tank can be found here. The night before roasting, remove giblets and turkey neck; rinse turkey inside and out. In a large stockpot or bucket, mix water wit remaining ingredients. Stir well until all the salt is dissolved. Place turkey in pot, cover with lid and refrigerate overnight or at least 8 hours. Remove turkey from brine, rinse well. Cook turkey as desired. *Soy sauce provided by Kikkoman. If you were my neighbor, i would gladly trade you some smoked turkey for your bundt cakes! That does look like one mighty fine turkey and I bet it smelled really good cooking! I will be making Thanksgiving dinner this year, but we’re doing it on Saturday instead of Thursday so we have all of Jake’s kids with us for the meal. It’s sort of rebel-ish. It did smell good — even hours after we had finished cooking! I hope you have a great Thanksgiving Saturday! My dad smokes our turkey every year. It is sooooo good. Now that I think about it, I don’t think I’ve ever had a traditional oven-roasted turkey! And I don’t feel like I’m missing anything! Although our turkey was only smoked halfway, the meat was so tender — even the drumstick. I’m sold on it. That turkey looks great! 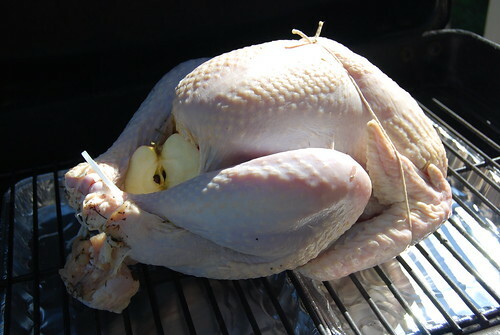 I just a read a great article online about using a turkey fryer and the shelf life of thanksgiving turkeys. 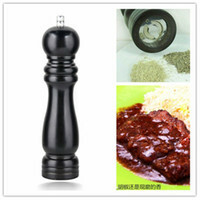 Check out http://shelflifeadvice.com. They have great articles relating to food storage and shelf life.